Across the train tracks from Sloss Real Estate’s flagship property, Pepper Place, and right across the street from the emblematic Sloss Furnaces is a complex of warehouse buildings called Sloss Docks. Comprising expansive warehouse, workshop, and office space, Sloss Docks offers big opportunities near Birmingham’s city center and is easily accessible for the city’s thriving neighborhoods of Avondale, Forest Park, Crestwood, and Woodlawn. For years Sloss Docks has operated primarily as a warehouse and shipping center for various regional companies from The Birmingham News to Iron Mountain secure storage. Keeping with Sloss Real Estate’s spirit of renovation and innovation, Sloss Docks is being given new life in the new Birmingham economy. 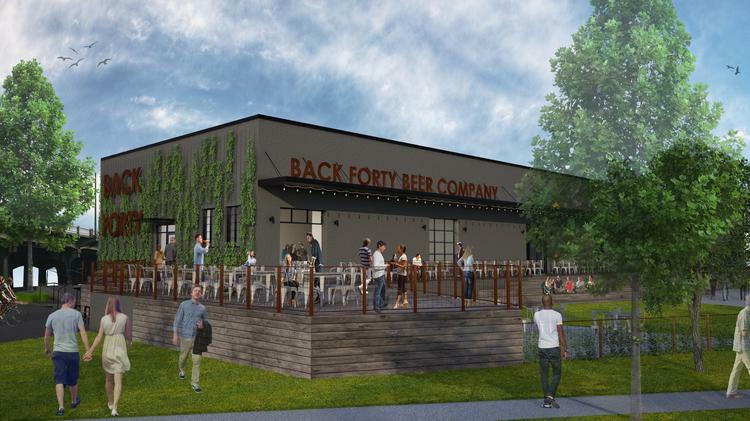 The beginning of this transformation is the expansion of Gadsden-based Back Forty Beer Company into the Birmingham market. Back Forty Beer Company-Birmingham will anchor the redevelopment of the 120,000-square-foot Sloss Docks. In addition to a brewery producing 2,000 barrels of beer per year, the location will feature a full-service restaurant with executive chef Russ Bodner, former sous chef for chef Rob McDaniel at SpringHouse on Lake Martin before becoming the executive chef of Kowaliga, also on Lake Martin. Conveniently located near the Birmingham-Shuttlesworth International Airport, with multiple docks doors, and located in an area positioned for excellent growth, Sloss Docks has more than 80,000 square feet of space remaining for redevelopment.